Canada Reads has announced its list of books and panelists for the upcoming competition in 2009. Canada Reads is a CBC radio annual contest where they determine one book each year that every Canadian supposedly will enjoy. In 2008, a hockey book, of sorts, won. Paul Quarrington's King Leary, defended in the competition by hockey writer/musician Dave Bidini, is a novel about a legendary retired ice hockey player living in a nursing home. The novel replays his life in flash backs as he journeys to Toronto to record a ginger ale commercial. Past winners include Lullabies for Little Criminals by Heather O'Neill, A Complicated Kindness by Miriam Toews, Rockbound by Frank Parker Day, The Last Crossing by Guy Vanderhaeghe, Next Episode by Jean-Louis Major, In the Skin of a Lion by Michael Odaatje. Quarrington's book was the first hockey book ever nominated in 7 years of this competition. No hockey books were nominated for the 2009 competition. Instead, we will find a winner from one of The Book Of Negroes by Lawrence Hill, Mercy Among the Children by David Adams Richards, The Outlander by Gil Adamson, The Fat Woman Next Door Is Pregnant by Michel Tremblay, translated by Sheila Fischman and Fruit by Brian Francis. These are all undoubtedly worthy, but none have anything to do with hockey. And that's why you are, and that's why I am here. The Game by Ken Dryden. 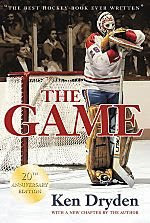 From Amazon.ca: An enduring classic, Ken Dryden's The Game has lost none of its luster since its original publication in 1983, and remains the one book every hockey fan must know. he Game is funny, acutely observed, and full of insight into human nature and the importance of sport in today's society. Dryden's portraits of his teammates are precise and unforgettable. Catching the balance between banter and seriousness, Dryden describes Scotty Bowman's pep talks; Serge Savard motivating teammates; the river skater Lafleur, in uniform hours early, reappearing and startling everyone into focus with a whack of his stick on the table; Larry Robinson sensing the wrong atmosphere before a game against a weak opponent and resetting the stakes with the unanswerable remark, "Gotta play it--might as well win it." The Game remains the classic insider's account of Canada's national sport. From Amazon.ca: Quebec fans revered him: They followed his accomplishments with tenacity; they taped pictures of Richard and his family to their kitchen walls, to their shop windows and to their store cash registers; and they memorized his statistics, his history and the names of his children. His season suspension in March 1955, after an on-ice brawl, ignited the infamous Richard Riots in Montreal, riots that some Canadian historians have suggested were a noisy precursor to Quebec's Quiet Revolution. In this lyrical and beautifully wrought narrative, Carrier evokes the thrill of watching or listening to the Rocket and his teammates play, the joy and agony of the Canadiens' rivalry with the Toronto Maple Leafs, and the struggle of daily life that formed the backdrop for Maurice Richard's spectacular accomplishments. Our Life with the Rocket also follows the history of a young boy, Roch himself, whose youthful worship of Richard was tempered by politics and personal life and evolved into an entirely different sort of appreciation for an extraordinary man. Open Ice: Reflections and Confessions of a Hockey Lifer by the late Jack Falla. From HockeyBookReviews.com: Open Ice is a collection of heartwarming and witty essays about hockey. The brilliance of the book is the author's effortless ability to make each individual essay flow from one into another. He accomplishes this using highly personal and reflective look back at hockey and of life. Each essay is part of the author's personal journey. Through his collection of hockey essays Falla is very open in engaging the reader in his struggles and dislike of aging. What other books do you think deserve mention? Hi Joe, for more hockey book reviews don't forget to check out the hockey books author Steve Zipp picked for the 2nd Canadian Book Challenge. Makes ya wanna lace up.